Symbioses is a decentralized global network of computing power that connects non-interoperable technologies, enabling them to work collectively and efficiently. Symbioses aims to lower the barriers of entry that exist in current blockchain technologies by providing a free and automated client application that runs in the background of a user’s device(s), making use of free and idle processing power, thus creating a platform to empower, connect, and benefit both producers and consumers of computing resources. 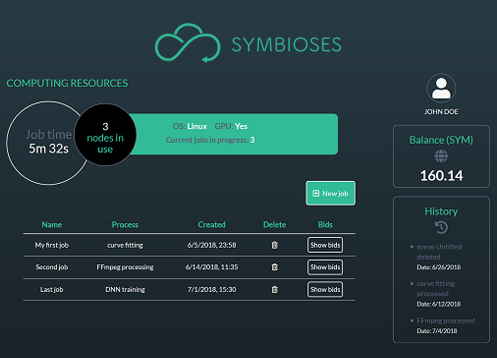 Symbioses aims to further extend the decentralized computing segment by delivering readily available Software-as-a-Service (SaaS) solutions accessible by anyone. Much like how Uber disrupted the taxi industry and Airbnb transformed the way we rent rooms, Symbioses provides the general public with a one-size-fits-all tool for real-time monetization of their existing devices; the available resources of which are shared by hosting turn-key SaaS solutions. Symbioses, a decentralized ecosystem for monetizing the spare computing resources of any device with a processor. It combines the available resources into accessible Software-as-a-Service (SaaS) solutions available in a payas-you-go manner. Fully compatible with existing cloud solutions and advanced distributed computing technologies, Symbioses empowers connected devices to forge their computing resources into turn-key SaaS solutions, determining their price, negotiating terms, executing agreements and gathering the rewards. Its main pillars are a multi-platform, multi-OS application that takes care of SaaS execution based on the availability of the device; integration with non-interoperable computing networks; a tokenized incentive program for end users to offer their resources to the network; an off-chain, abstraction layer to maximize the response time of the network and minimize the transaction fees; and a decentralized consensus engine over a blockchain payment ledger. Solid team strategy, well thought out roadmap and a optimisitic yet acheivable vision, firm believer in the rise of the crypto cloud this project really has the potential to be a great addition to the growing need for stable security crypto hosting infrastructure projects. Price negotiation for space is an area that has potential to deliver value deeper inside the blockchain based SAAS supplychains, if delivered with a viable UX this alone could add significant vertical value to the entire offering as determining the price points as which decentrlalised cloud SAAs become viable and even self sustaining. Design of the first alternative and viable prototype. With the blockchain scalability issues gaining more attention, the team recognized about the potential of this technology for decentralized and blockchain-driven applications. First proof-of-concept running on top of a blockchain. ICO Summit. Initial Business Development around the tech. Business creation around the existing MVP. First public presentation of the project and business proposal in a Blockchain event in Switzerland. Prototype version available for public testing and access.